These last few weeks have been the strangest weeks here in the hot and dry land of Albuquerque, New Mexico. We have been experiencing something that is rare to us, and almost foreign. The little drops keep falling down from the sky every night when these huge black clouds gather together. And when they hit you they explode like tiny little water balloons that are being dropped by the millions. I think somebody up in the sky is keeping score of how many water balloons fall too, because every few minutes there are these bright flashes from the sky, followed by the crowd above roaring with excitement. 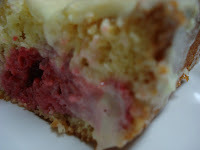 I give you my Rainy Day Blues Lemon Cake with fresh raspberries! 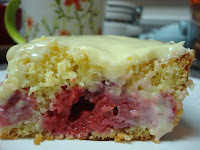 (I actually cheated a little bit by using a store bought cake mix...blame it on the weather) Which came out really well, I simply made the batter, spread it in the pan, dropped the raspberries on top and shoved her in the oven. 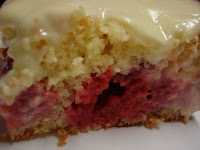 I usually don't like raspberries in my cakes or desserts because of the seeds, but surprisingly the seeds seemed to have baked there way out of my cake. Which made me one happy camper. Hope that you all aren't experience this streak of weird weather, but if you are...look on the bright side...there's always cake!! ...I unfortunately couldn't participate in this weeks TWD because I don't have a food processor :( I'm hoping to buy one within the next two weeks though, and I'll have to play a little catch-up. But too see all the marvelous Chocolate Puddings visit each TWD member, and thanks to Melissa for choosing such a yummy looking recipe, I hope to try it soon!! Rain in Albuquerque is one of my favorite things ever. I miss it! You don't have to have a food processor for this recipe. I only used one pan -- can't see getting so many things messy just for pudding. So, when you have a chance, give it a try with just a whisk and a pan! Too bad the rain you are now getting isn't being taken from us cause we have had so much rain it is pitiful. I have a food processor, but it is way too small for the recipe. I just used a whisk and and it wasn't difficult at all. Your cake looks yummy though! Try it. It's worth it. And you won't care if it's raining.